We’re participating in an upcoming exhibition entitled, Public Realm, at Propeller Centre for the Visual Arts in Toronto. For the exhibition we’re going to be doing some outdoor projection around the gallery, and we want to have your input! 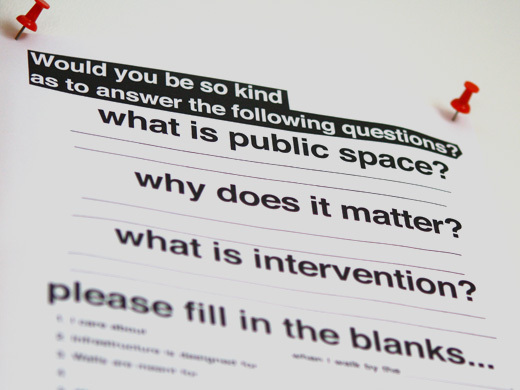 We want to know what you think about the public realm, and about public and private space, and about what you can do in that space and maybe even, why you’d want to bother doing something in that space in the first place. We’re going to project all of the submissions we get on Thursday, January 21st, as part of the opening for the exhibition! On Thursday, January 21st at the Propeller Centre for the Visual Arts in Toronto, we’ll be doing a projection performance that examines the language and ideas surrounding public space, intervention, urban surfaces, and city infrastructures. As part of Propeller’s Public Realm exhibition, we will curate a text-based list of ideas, statements, and questions, that address the concerns embedded in our practice and that appear to be at the heart of the exhibition itself. We will ask for the participation of those in attendance, along with other momentary collaborators through tools such as Twitter and SMS, for submissions during the duration of the performance. 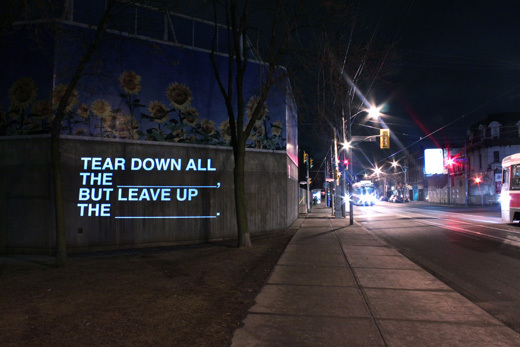 The projection itself will consist of white text and will be projected onto the façade of a nearby building. Photographic documentation of the projection will be installed in the gallery space afterwards. Public Realm opens on January 20th and runs to January 31st, 2010.